British Prime Minister Theresa May attends a church service on Sunday in Aylesbury, England. May is reportedly facing pressure from within the Conservative Party to quit over her handling of the Brexit process. 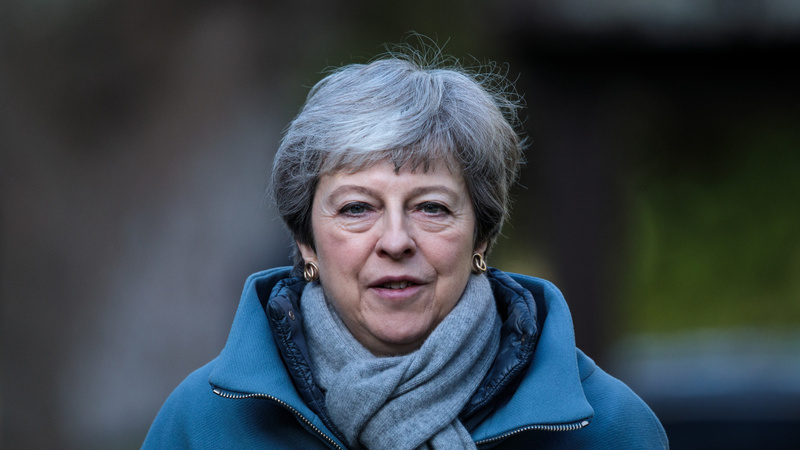 A number of British parliamentarians, including senior members of May's own Conservative Party, have wanted her out for some time, NPR's Frank Langfitt tells Weekend Edition Sunday. British newspapers on Sunday reported that senior members of May's cabinet could resign in order to force her resignation. Chancellor David Lidington, the prime minister's de-factor deputy who voted to remain in the EU, denied rumors of a plot to oust May, telling reporters that he was "100 percent behind" her. Michael Gove, the Secretary of State for Environment, Food and Rural Affairs, who was also named in the papers as a possible caretaker prime minister, said that it was "not the time to change the captain of the ship." May has not responded to the reports, but No. 10 Downing St. insists that she is going nowhere. Fellow conservatives and pro-Brexit lawmakers, including Boris Johnson, met with May at her country residence in Chequers on Sunday. Despite the pressure she is facing to step down, May has survived two no-confidence votes in Parliament, the most recent being in January of this year. She cannot face another leadership challenge from within her own party until December, according to party rules, but if several members of her cabinet resigned, she could be convinced to quit. "Changing the players doesn't solve the problem," Chancellor of the Exchequer Philip Hammond told Sky News Sunday morning. "The problem is that we as a nation have to decide how to deliver Brexit." Still, May angered lawmakers last week when she delivered a speech blaming Parliament for the Brexit stalemate. And if Saturday's demonstrations are any indication, May is also losing support among voters. An Ipsos/MORI poll released this past week shows that 86 percent of Britons are dissatisfied with her leadership. May could present her Brexit plan for a third vote next week, but she has said she would only do that if she was certain it had enough support to win. If Parliament can agree on a plan next week, the United Kingdom will have until May 22 to leave the EU. But if Parliament can't get a deal done, it will have to devise a new plan or leave the EU with a "no-deal" Brexit on April 12, which most experts say would be a nightmare scenario.